Cahal Pech: Update 1 "Maya Caves of West-Central Belize"
At the site of Cahal Pech one of the structures under investigation, Structure F-2, is a large building located in the site core. This building is part of two plaza groups, the G plaza to the east and the F plaza to the west. F-2 is one of four structures that border the courtyards. Previously F and G were designated as service plazas, and it was thought that the structures may have served as dwellings for subservient elite assistants. The goals of BVAR's investigations at F-2 are twofold. The first objective is to clear the terminal phase architecture of the structure for consolidation by a Government Of Belize tourism development project. The second goal of our investigations was to determine the actual status of the occupants living at F-2. Were the residents indeed "service" level people, or did they enjoy a higher status, such as artisans, scribes, or other craft specialists? Investigations at Structure F-2 have progressed well in the last month. We have cleared the terminal phase architecture across two-fifths of the structure. 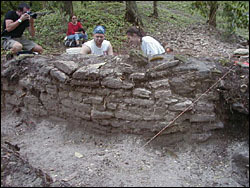 From our initial examination of the architecture, it appears that F-2 was constructed in a similar manner to other structures at the site of Cahal Pech. The walls were constructed from shaped limestone blocks that retained earthen fill. These walls were plastered, both to make them look better and to protect the wall stones from erosion. The walls were also probably painted (we have found evidence of red painted plaster from earlier levels), but poor preservation of the terminal architecture has destroyed most traces of paint. From the west (or F Group plaza), we have learned that Structure F-2 had a three-step exterior staircase leading up to two terraces and then unto a building platform. From this platform, a doorway leads into a long and narrow interior room that measures between 1.2 to 2.5 meters wide by at least 3 meters long (the extent of our excavations thus far). As a result of later modifications, this interior space was reduced with the addition of a bench feature. We have also uncovered a doorway leading to the eastern plaza (or G Group plaza). Further excavations will begin to uncover the eastern side of the structure, which appears steeper and less well preserved. Four excavation units have been placed to penetrate into the platform. All units are located on the central axis (east-west) of the building. Two units are located in the interior room, one on the second terrace, and one in the plaza area. These units have yielded a series of replastered floors and construction phases, as well as a number of ceramics, which will be used to date these construction periods. Found in Unit 21 was the remains of a polychrome plate that had carved graffiti from Precolumbian times. Maya graffiti is a relatively rare find, with the majority of graffiti found located on the walls of temples and palace buildings. In the next few weeks, we will continue excavations along the eastern side of the structure to expose the terminal phase architecture, and we will continue our excavations in the interior of the structure to determine the dates of reconstruction at F-2. 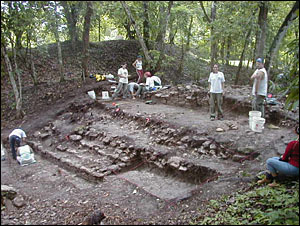 Excavation at Cahal Pech's F-2 structure in 2000 was supervised by Carolyn Audet, a graduate of Princeton University.